The CPB Women of Worth (WOW) Award Committee is responsible for producing the annual WOW Award Luncheon, which honors outstanding women who have achieved professional excellence, serve their community, and have strengthened and enriched well-being in Central Palm Beach by helping to advance the educational, cultural, and economic interest of the community. 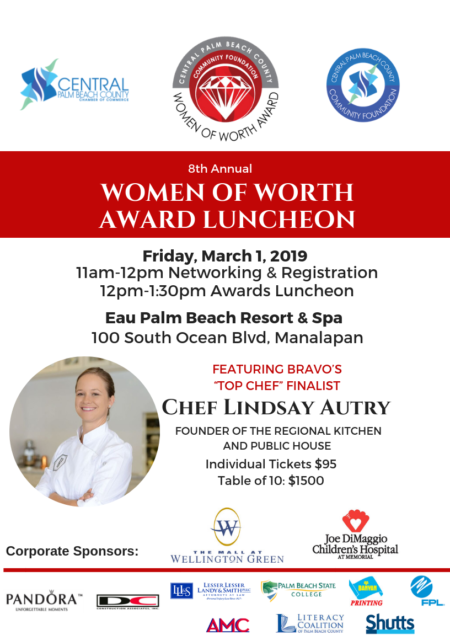 Congratulations to the 2019 WOW Award Recipients! To learn more about sponsoring this event, please email info@cpbchamber.com or call 561-790-6200. Entrepreneur: Ashley Tripp, Tripp Electric Motors, Inc.
Young Professionals: Gabie Ervesun – ASR – Group/Florida Crystals Corp.